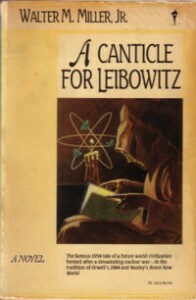 70 A Canticle for Leibowitz, Walter M. Miller, Jr. I dislike post-apocalypse stories–possibly unreasonably so–because of past experience. For every Alas Babylon, there were real dogs like The Postman or The Day After. This is the main reason why I had never read Walter M. Miller’s classic novel A Canticle for Leibowitz. Since it kept appearing on my Alexandria Digital Literature recommendation list, and several people had expressed amazement that I had never read it, I decided to overcome my bias, and at least give it a try. It started out bad–the main character avoiding a possible mutant in a desolate Utah setting that included a fallout shelter (and the word fallout had new meaning, describing a “scary” monster of the past). Yawn. But I persisted, and it got better. The middle section, “Fiat Lux,” occurs a few centuries later, when human society is being rebuilt, as well as new scientists trying to re-work the old knowledge. The interplay here is between the monks who wish to preserve the old information until the time is right, and the new scientists, who insist that the time is now. The opening of this section, describing one of the nomad groups of the plains, reads too much like Robert Adams’ interminable Horseclans novels, but Miller can be forgiven that, by not only being first, but also for having the good sense to stop after one chapter. It is the last section, “Fiat Voluntas Tua,” that really sets this novel apart from the crowd, and, in my opinion, confirms its classic status. Set in the far future, when all of society has been rebuilt, including the nuclear technology that caused the first cataclysm, the Abbot of the preserving order finds that humans did not learn from the past, and that preparations must be made for another period of darkness. As in the other sections, Miller is able to make this future scenario entirely believable. If A Canticle for Liebowitz had been confined to just one of these sections, I would have hated it. But the three sections are basically inter-connected novellas that do manage to create the semblance of a single novel at the end. Miller did nothing to change my aversion for post-apocalyptic works, but I did gain appreciation for his take on it. As a footnote, within months there will appear a “sequel” to this novel, entitled Saint Leibowitz and the Wild Horse Woman. The novel was outlined and many sections were completed before Miller’s death, and has been finished under the guidance of his estate from his own notes by Terry Bisson. I’m not much of one for these types of literary collaborations, but I doubt I would have picked it up if it had been entirely Miller’s work, for it sounds to we like he has expanded on the least interesting section of the earlier novel. Your mileage may vary, but caveat emptor.